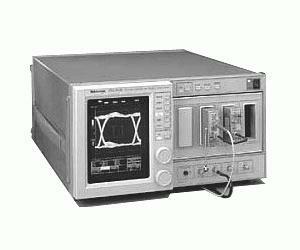 The Tektronix CSA803C Sampling Oscilloscope generates measurement results, not just raw data, with time and voltage histograms, mask testing, and statistical pulse parameter measurements. It provides a communications-tailored measurement set that includes jitter, noise, duty cycle, overshoot, undershoot, extinction ratio and amplitude measurements. Requires Plug Ins.